Junior League of Mobile, Inc. (JLM) places trained volunteers with selected community partners in support of our current area of focus or Impact Area. 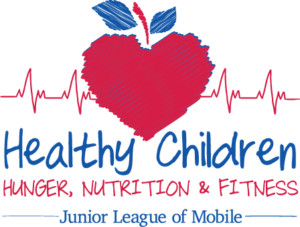 In 2012, JLM members voted to adopt the new Impact Area of Healthy Children: Hunger, Nutrition and Fitness. In 2013, JLM will review, accept and adopt new placements to begin in June 2014. Final placement determinations are voted on by the JLM membership and are based on JLM’s mission, impact area, measurable community impact, membership interest and available JLM resources. JLM placements typically run from June through May and require between 20-50 hours of a JLM volunteer’s time over the course of the JLM fiscal year. A typical placement consists of 8-20 volunteers organized by a committee chair and assistant chair. The majority of JLM volunteers are working professionals and prefer evening and weekend hours. JLM volunteers seek opportunities that are fulfilling, allow flexibility in their schedule and provide skill-specific training. Members are seeking more task-completion type projects that might require a few months of planning and 1-2 days to implement. Ultimately, the goal is to match our volunteers with unique, fulfilling volunteer opportunities that allow a measurable impact in Mobile and Baldwin communities and in our current Impact Area. The application deadline for agencies to be considered for the 2014-2015 calendar year has passed and was March 1, 2013. Community agencies who would like to be considered for the 2015-2016 calendar year and future years (2015-2019) may submit applications. JLM will accept applications that are completed and submitted to JLM Headquarters by 5 p.m. on Friday, March 7, 2014, have all the required exhibits and include the signature of the agency’s Executive Director or President of Board of Directors. JLM provides both volunteers and funding to community partners. A community partner may receive volunteers only or may receive a combination of volunteers and funding based on the needs of the specific program and the goals of JLM relative to the program. However, JLM does not provide funding to a program that does not also have a volunteer component. JLM will consider funding requests that are directly related to the program for which volunteers are requested but will not fund ongoing operations or staff salaries. Community partners are recommended to JLM’s membership for final approval after an extensive vetting process that includes a thorough review of the agency and the program for which volunteers are requested. Community partner programs are presented for final approval by the Project Development Chair for a vote at our General Membership Meeting. Junior League of Mobile has a long and distinguished record of service to the Mobile and Baldwin counties. We look forward to continuing this legacy through collaborative approaches and partnerships within the community that allow us to fulfill our mission and provide our members with meaningful volunteer opportunities within our area of focus. Questions? Please contact JLM Headquarters at 251-471-3348.